When your dinner guests include a scientist who makes ice cream with liquid nitrogen at his own parties, and a food writer and broadcaster who is notorious for his adventurousness, how do you surprise and entertain them? 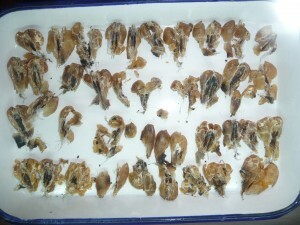 I decided it was time to cook the dried frog ovaries I bought in Hangzhou last year. 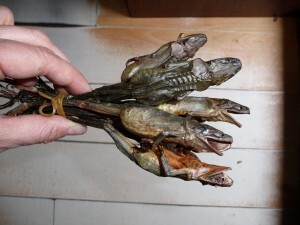 Known in Chinese as 雪蛤 (xueha), and in English as hasma, hashima, snow frog etc (see this article by Jacqueline Newman in Flavour and Fortune), it’s one of those Chinese delicacies that is baffling to Westerners. 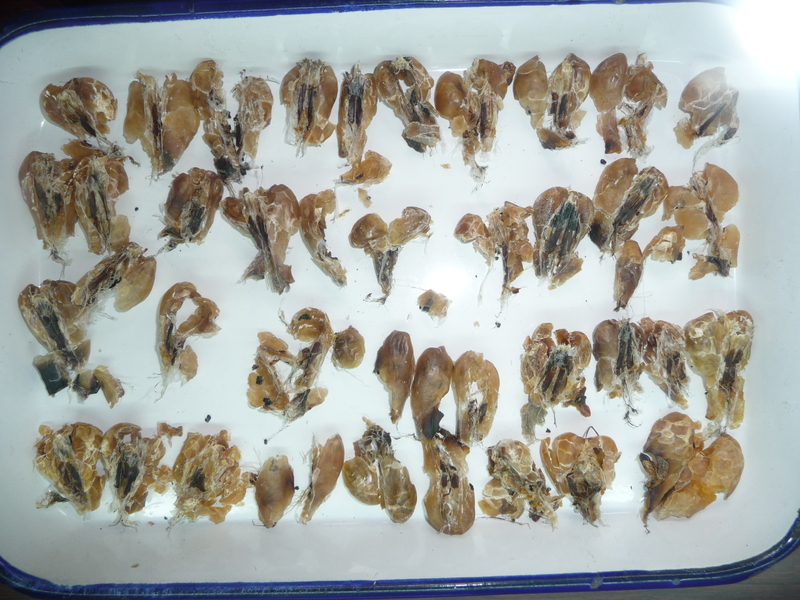 It’s usually described as frog fallopian tubes, ovarian fat or ovaries – I’m not sure exactly what is is, but it’s the waxy looking amber-coloured stuff that encloses the eggs of dried snow frogs from the northeast of China. 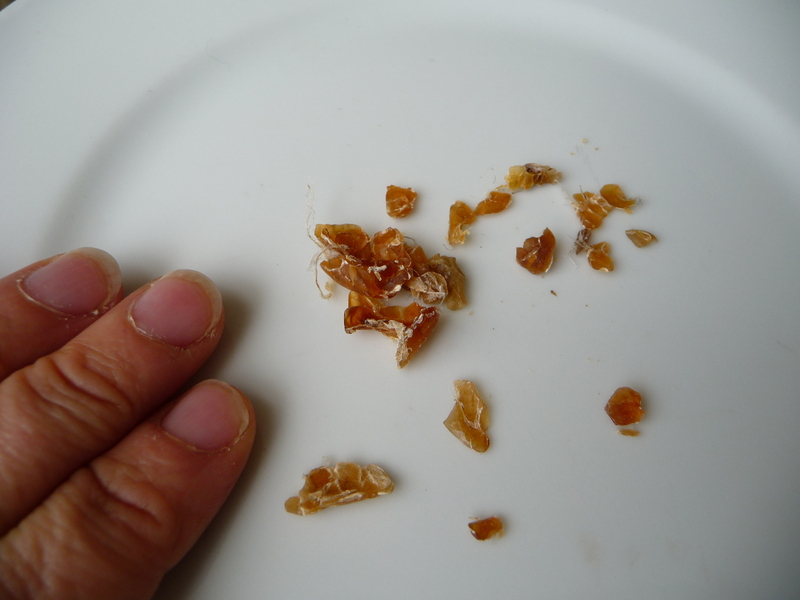 After a long soaking, and steaming, small pieces of this substance expand miraculously into flubberous, transparent clouds of tasteless texture. They are often served with papaya, or in soups that may be slightly sweetened. 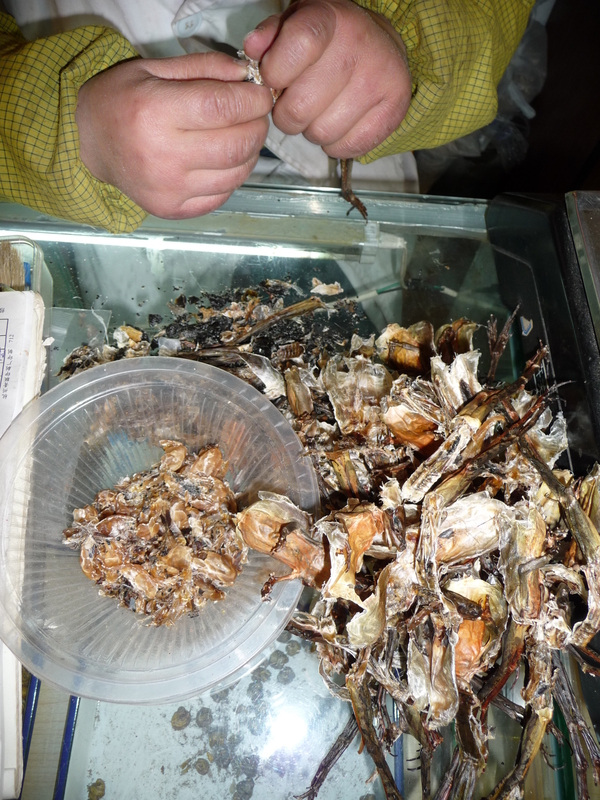 I can’t remember where I first tasted xueha, but its precise origins were mysterious to me until I came across some women dissecting dried frogs to extract it in a medicinal store in Hangzhou (see photographs). Curious, I bought a small amount, and it remained in my fridge until yesterday. I called Zhang Xiaozhong, the head chef at Barshu, for advice on how to cook it. He told me that I hadn’t really allowed enough time to soak it in cold water and steam it, so he suggested that I speed things up a bit by soaking it in warm water and cooking it slowly over a small flame. In the end I served the xueha in hot water with a few crystallised violet petals that I bought ages ago in Salzberg – which is why the finished dish has an eerie purplish colour. Everyone was slightly surprised that such a delicacy had no inherent flavour. One guest said the slimy, slippery ovaries resembled bogies from someone’s nose. Fortunately they were more impressed with the other dishes, which included crowndaisy chrysanthumum leaves with sesame oil among the starters, Dongpo pork, steamed wild sea bass, fish-fragrant aubergines and so on. A cake, sausage or stew to rule over us? My mom has been making xueha soup since I was kid. This is my first time to officially know what they look like…… I have no idea they are frogs……speechless. 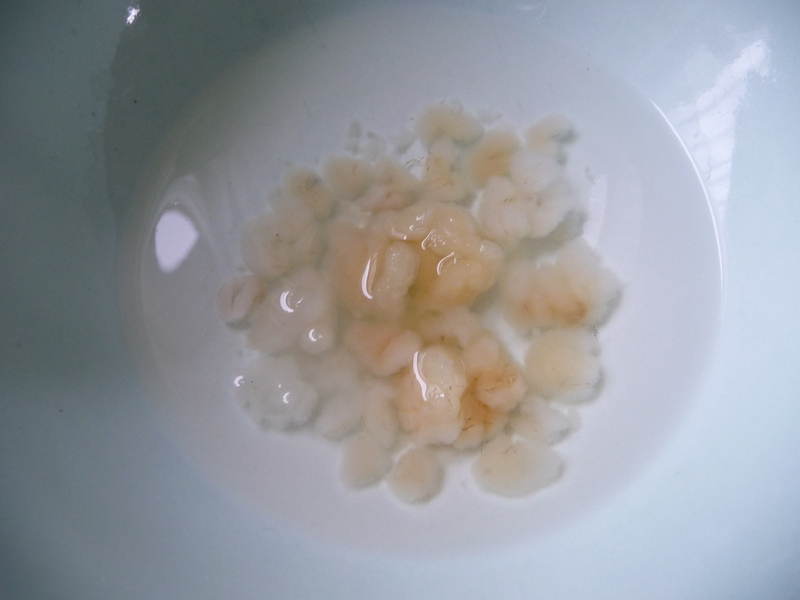 Ah, I was in Hangzhou in January and I neglected to pick up some frog ovarian fat. You mention you made the purchase in a medicinal food store and I was wondering if you or a colleague know what the purported medicinal benefits of eating this are. My mother has also been cooking this since I was old enough to eat and i never knew they were from frogs! We call them xu kap in Cantonese and they were often boiled with rock sugar. I remember my mother used to spend endless afternoons with a tweezer, picking at the black thready bits. Do you and Audrey think that Chinese mothers deliberately avoid telling their children where xueha comes from? If your mothers had told you, would you have still enjoyed eating it? I thought my first time having frogs ovarian fat was at Yu Jia in Chengdu (where I met you very briefly, actually, with a group of friends I was dining with). But I’ve had the cantaloupe dish so many times and never knew what the white slime was! My friend and I had these while we were in China. It was served to us in a soup inside of a papaya half, and neither of us had any idea what it was. Someone tried to explain what it was and between my poor Chinese and the description of it as being “good for the complexion”, somehow the two of us settled on the idea that it was Aloe Vera. My friend loves Aloe Vera and so she devoured it. Of course, some time after the fact, it was properly explained to me that what we ate was, in fact, frog ovaries. But learning it was ovaries way after the fact took the shock value out of the whole thing, and my friend’s reaction was essentially a shrug of the shoulders at having eaten the ovaries of a frog. Ah, I never knew they were the ovaries, learn something new every day. My mum makes this quite often and it is a weekly tonic which is both good for your complexion and also has the same anti ageing properties of birds nest. It is used interchangeably in some desserts as it’s so much cheaper. Best way to prepare it is to double boil or slow cook it with some dates and rock sugar. 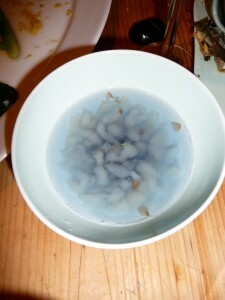 Just come back from southern china having been served frogs ovaries with coconut milk & liquid sugar. At first I thought it was a sweet congee, as my HK Chinese colleagues didn’t want to say what it was, until after I’d tried it. It was ok as sweets go, no worse than the Tapioca pudding I had as a school child in the UK and probably far better for me!! My Mom used to cook this as a dessert soup with rock sugar too! She also made this with coconut milk & rock sugar a few times. I love the coconut milk one! The reason Chinese eat these is because in the days before modern medicine, there was no other way to get estrogen. Ovaries contain small amounts of estrogen and other hormones, which obviously helps with your skin, complexion and a whole host of other stuff.